In August, 2014, Rabbit Advocacy Network, with the help from lauren Ornelas of Food Empowerment Project, placed a Freedom of Information Act request with the USDA to get records from the slaughterhouse inspections done at the Iowa Rabbit, LLC slaughterhouse in Jewell, Iowa, where the rabbits who are killed for Whole Foods Markets are slaughtered. Because the report was redacted, we had no way to know, however, how many rabbits were actually slaughtered at this facility per day, week or month. We sent in an appeal in November 2014 to request more information, including the numbers of rabbits who are actually “processed” at that plant, and our request for those numbers was denied, as the USDA, siding with Iowa Rabbit LLC, sees this information as proprietary. That denial can be read here and here. Why is the USDA colluding with Iowa Rabbit to hide this information? 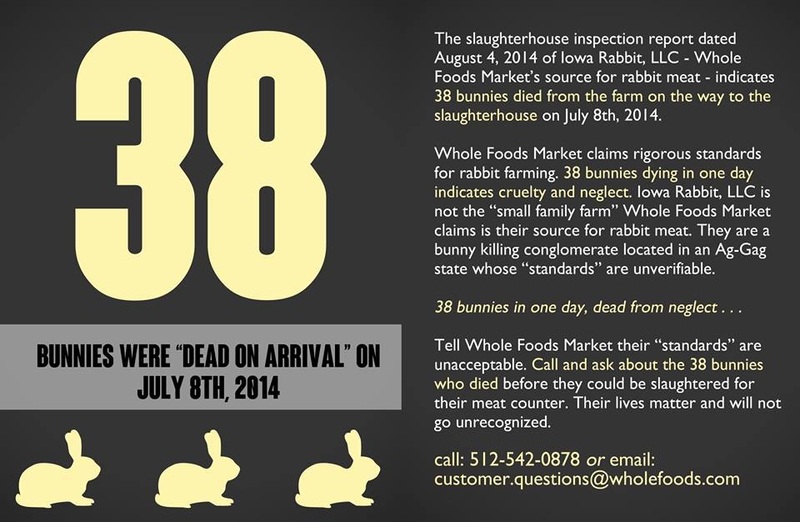 How many rabbits are dying at Iowa Rabbit to provide Whole Foods with profits? RAN Gets FOIA; Finds Out More About Iowa Rabbit What Does “Humane” Mean to Whole Foods? NBC Bay Area Investigation Uncovers Truth About Whole Foods Will Rabbits Be The Next Chicken?